Marine Biology - Pacific White Sided Dolphin, British Columbia. The term marine biology means the study of living organisms in freshwater and ocean biomes. Each year, the Northern Vancouver Island region attracts many biologists researching the various marine life forms found in the surrounding waters. With such an extensive marine biology interest in the dolphins and whales there is a lot of important information gathered for future generations. 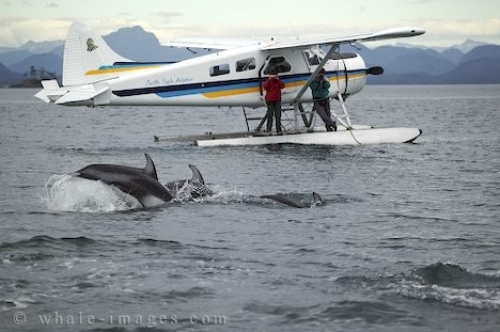 Photo of a plane landed on the water to watch Dolphins swimming by.